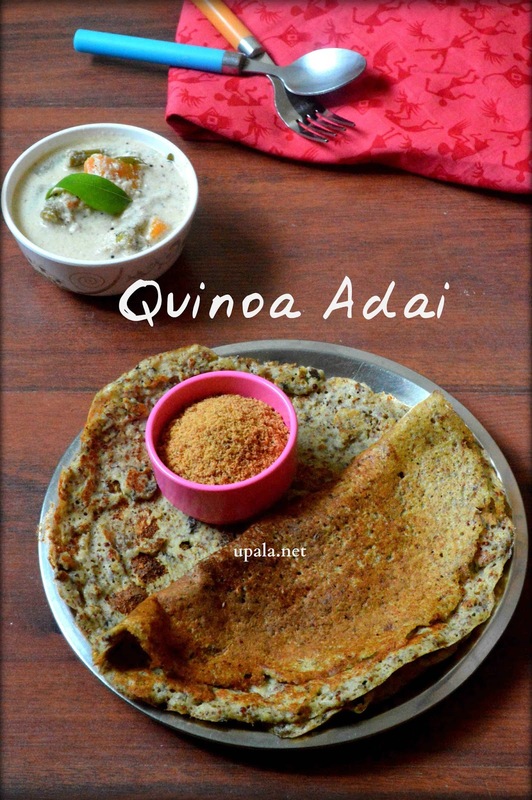 Quinoa Banana Flower Adai is a South Indian recipe made with the western ingredient Quinoa. Being a popular health food, you can incorporate Quinoa in almost all the dishes without compromising your taste buds. This Quinoa Adai is a gluten-free recipe made with a combination of all healthy ingredients. If you are particularly looking for a No Onion No Garlic recipe then this recipe is for you. I have tried few more recipes with Quinoa and they are"Quinoa Dosa" and "Quinoa Paneer Bread Rolls". Both the above dishes were a super duper hit in my blog, loads of people have already tried and loved them. If you are a Quinoa fan then here are few interesting facts that you might probably not be aware of, Click here to have a glance at. 1) Wash and soak Quinoa (both red and white), pulses (toor, channa, urad, moong) together for 1 hour. 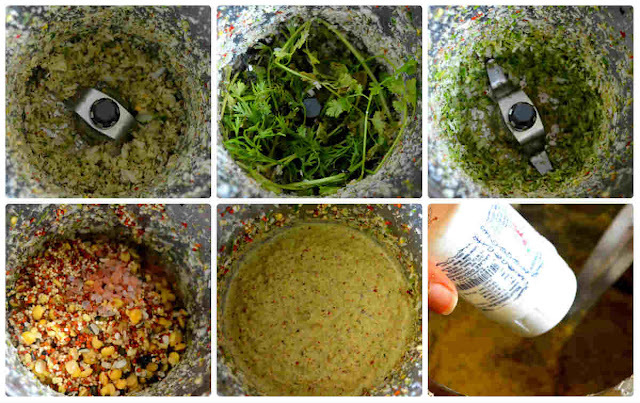 2) Grind the coconut pieces, green chillies, red chillies and ginger to a coarse mixture. 3) Add coriander leaves and grind again. 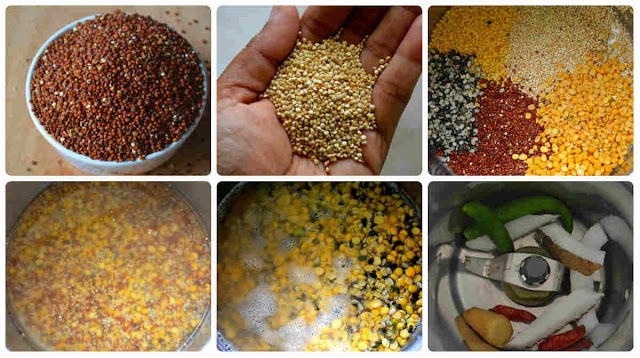 4) Drain water from quinoa and pulses, add it along with salt to the mixer. Grind it to a coarse paste by sprinkling water and the batter needs to be more coarser than idli batter. 5) Add hing to ground adai batter and mix well. 6) Now, add the finely chopped banana flowers and mix well. 7) Heat the dosa tawa and drizzle some oil. 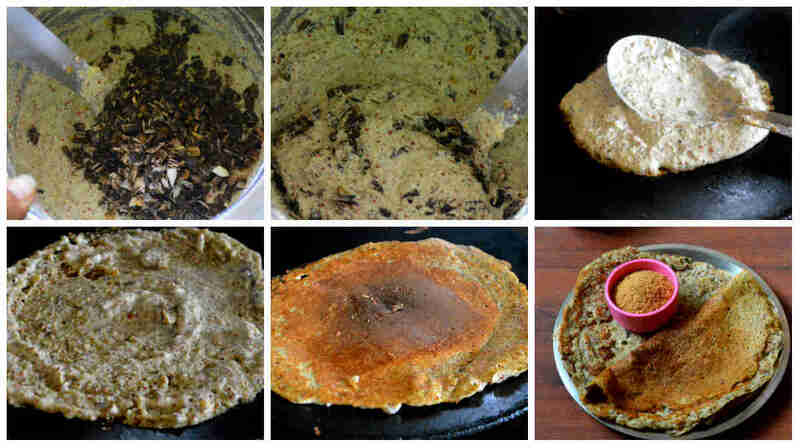 8) Pour a ladle of this adai batter and spread it to form a circle. 9) Drizzle oil on the sides of the adai and allow it to cook in medium flame. 10) After one side of the adai turns crispy, flip it around to cook the other side. 11) After both sides are cooked, serve hot with avial or jaggery powder. 1) Instead of Vazhaipoo, you can also add finely chopped onions or any other veggies according to your taste. 1) If you are pretty new to Vazhaipoo/Banana flower and donno how to clean it then click here to see the procedure for cleaning and chopping this flower. Awesome video ... Thank you !